The NFL schedule is set to be released this week, which means it’s time to talk about Chicago’s 2019 opponents. We already know all 16 teams they’ll be facing, and one of the reasons I’ve seen people suggest that the Bears are in for a rough 2019 is that they are going to have a really hard schedule. This fear is significantly overblown and is largely based on two pieces of misleading information that I want to debunk today. The first reason I’ve seen repeated over and over is that the Bears are in trouble because they go from a “4th place schedule” to a “1st place schedule.” That is, they had an easier schedule in 2018 because of their last place NFC North finish in 2017, but winning the NFC North in 2018 sets them up to face a much more difficult slate in 2019. Let’s take a minute to review how the NFL schedule is determined for every team. If you’re paying attention there, you’ll notice that 14 of the 16 games on a team’s schedule are determined exclusively by what division they play in. So every single year the Bears play Green Bay, Detroit and Minnesota 6 times and 8 of the exact same opponents as those division rivals. Only 2 games change based on how you did the year before. The Bears’ last place NFC North finish in 2017 meant they played the Giants and Buccaneers in 2018, while other division opponents played different teams from the NFC East and NFC South. In those 2 games, the Bears went 1-1, and they went 11-3 in their 14 common games. If you’re scoring at home, that means the “last place schedule” actually hurt the Bears’ win % en route to their division title in 2018. Now in 2019, the Bears will play the division winners from the NFC South (Saints) and NFC West (Rams), while their divisional opponents play the corresponding teams to THEIR finishes. On paper the Bears will face harder opponents than the Packers, Lions, and Vikings, but who knows if that actually ends up being true? It might be that one or both of Chicago’s opponents struggle this year. Another team from those divisions might unexpectedly take a significant step forward. The Bears could face them with a key player out due to injury. Changing 2 opponents out of 16 simply doesn’t make a huge difference. Just like in 2018, the Bears will be fine if they take care of business directly against their NFC North foes. The second reason people have worried about Chicago’s schedule in 2019 is that it is supposed to be really hard. That’s largely based on pieces like this one from CBS Sports using 2018 records to project the difficulty of the 2019 schedule. Oh no! The Bears have the 5th hardest schedule in the NFL in 2019! That can’t be good. Except that exact same piece by CBS Sports last February had the Bears with the 8th hardest schedule for 2018, and the exact same opponent win percentage of 0.520. Guess what? The Bears still went 12-4, and their opponents finished with a combined win % of 0.430, the lowest mark in the NFL. That’s right, the “8th hardest schedule” in the NFL actually turned out to be the easiest. 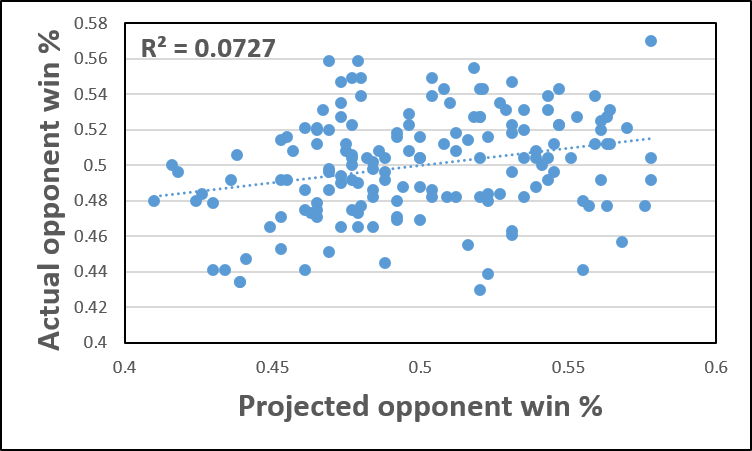 In fact, I looked at the actual strength of schedule compared to the projected strength of schedule for each of the last five years and found that the correlation was only 0.07, which is to say that there was no relationship at all, as you can see in the graph below. The first-place schedule only changes 2 games on Chicago’s schedule, and those games actually hurt their record last year. And their projected difficult schedule is the exact same projected difficulty as their 2018 one was, but those projections are completely useless anyways, so you shouldn’t care. It’s entirely possible the Bears end up having a really hard schedule in 2019 that costs them a playoff berth. But this is one of the most talented rosters in the league, and they shouldn’t be afraid of playing anybody. If they play up to their potential, they’ll be very good and win a whole bunch of games again. If they don’t, they’ll slip, but it will have much more to do with them playing poorly than with a change in the teams they had to face.